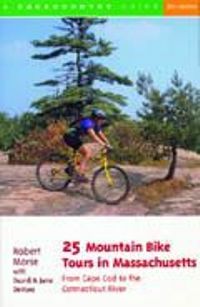 25 Mountain Bike Tours in Massachusetts, by Robert S. Morse, 2nd Edition, 2000. A variety of off-road rides from the Connecticut River to the coast. Each ride includes description and historical info, mileage log/directions, and map. Illustrated with black & white photos. 202 pp, 5 ¼” x 8”.